Actor's historic home in San Francisquito Canyon is now a county park and museum. he spirit of Western movies lives on in Santa Clarita. A dedication ceremony for Tesoro Adobe Historic Park was held Thursday, officially recognizing the park's historical value as the former home of early Western film actor Harry Carey. The home, one of seven buildings at the park, is made out of tightly compacted earth, clay and straw  also known as adobe bricks. Strewn with Western paintings on the walls, the home has two fireplaces, Western-designed rugs, bull horns on the top of doorways and a deer head in the master room. 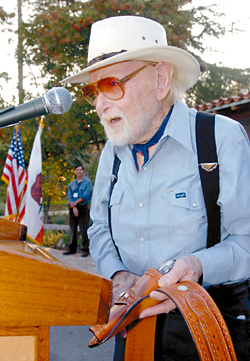 Harry Carey Jr., who was on hand for the dedication along with his wife, Marilyn, and sister, Ella ("Cappy"), spoke to a crowd of about 100 people about his personal history with the house as well as the changing nature of the surrounding area. The area has a manmade lake to the south and housing tracts all around. "It's changed a lot, but I've changed a lot since I was last here too," Carey said. The original site of the nearly two-acre park was about 1,700 acres in size when the Carey family moved out of the property in the mid-1940s, said Tina Raleigh, a regional supervisor with the Los Angeles County Department of Parks and Recreation. Harry Carey Sr., who starred in more than 200 movies before dying in September 1947, had the ranch house and the surrounding buildings built in the 1930s after their original house was consumed in a fire. They maintained a ranch in San Francisquito Canyon  much of which is now the Tesoro del Valle development  from 1916 to the 1940s. The ranch at the mouth of San Francisquito Canyon was not just home to the Carey family, but also was a tourist attraction complete with Navajo performers and a trading post constructed by Carey to capitalize on the "wild and wooly West" popularity of the early 1900s. The trading post washed away in the 1928 St. Francis Dam disaster. Harry Carey Sr. performed films from the 1910s to the 1940s, surviving the transition from "silents" to "talkies." He promoted filming on his Santa Clarita Valley ranch and helped draw the industry to the area. Harry Carey Jr. said he and his father buried their horses in the surrounding area, and noted the importance his father placed on the home, which he said was visited by "all types of cowboys." "When (Harry Carey Sr.) drove off this place, he aged 10 years, just like that," he said. "And I know why: It's because he loved this place so much." In 1952 the Clougherty family, the owners of the Farmer John product line, purchased the property. The family used the ranch as a vacation home until about 1999, Raleigh said. In the 1990s the Clougherty family formed Montalvo Properties, which partnered with Evans-Collins Community Builders to develop the 1,800-home Tesoro community on 1,200-plus acres. Tara Clougherty and her mother Terry said their family would spend long holidays as well as many family trips at the property. "We would always sit out here and the stars were so beautiful," she said. While the family was living in Tucson, Ariz., Terry said she would always look forward to the month of August, when they would spend the whole month at the Santa Clarita Valley property. "I would tell people we were going to Saugus and they thought I was crazy," she said. County Supervisor Michael D. Antonovich presented commendations to recognize "the generosity from a number of people" that made the park possible. "It's back to the future for the (Carey) family," Antonovich said. The park will be open for school class tours. Raleigh said she is hoping for the park to be open every Saturday from 10 a.m. to 3 p.m.